How a French statue created in 1641 and an excerpt from a philosophical ramble dated 1880 can inspire a 2014 funny t-shirt. 1987 marked the year of the devastating Black Monday Stock Market crash, the Unabomber attack on Salt Lake City, and the unexpected death of famed pop-culture artist Andy Warhol. While things were looking pretty bleak, the tragedies of 1987 were slightly alleviated by some positive introductions into the marketplace. Two highlights would be the release and distribution of Prozac, and development of the Steampunk literary genre. K.W. Jeter coined the term in a 1987 letter to Locus science fiction magazine regarding a review of his co-authored novel, Infernal Devices. He forecasted that mixing in modern technologies, specifically the steam engine, with the Victorian era would be the next big thing in fiction. “Steampunk” branched off into a new sub-genre showcasing reimagined historical eras and events that blended accurate portrayals of cultural references with the exaggerated use of modern steam engine machinery. The outcome ranges from post-apocalyptic versions of the 18th century, to wild westerns with towns full of people who have steam mechanisms for limbs and weapons. Rodin’s bronze sculpture was originally created as part of the La Porte de l’Enfer (The Gates of Hell) as a decorative entrance depicting a scene from the Devine Comedy to a planned art museum in Paris around 1880. It has been reproduced in nearly 30 full-sized castings and is primarily used as a symbol for philosophy. As a common emblematic mash-up, The Thinker is often accompanied in illustrations with the “I Think Therefore I am” axiom deriving from Descartes’ 1641 publication, Meditations on First Philosophy. Descartes narrates his search for truth about what really exists and challenges everything that is accepted as “reality”, including his own mind’s continuation. He concludes that BECAUSE he has the ability to contest the certainties of life, he IS, in fact, real. How would this translate into a Steampunk human-blends-with-machine world? Illustrated on this funny t-shirt, our version of The Thinker presents a transparent man whose physical being is a collection of metal gears and mechanisms, however his facial expression appears as deeply in thought as Rodin’s world-renowned Paris statue. He not only accurately portrays the visual integrity of the sculpture; he displays a literal take on how thinking IS being. 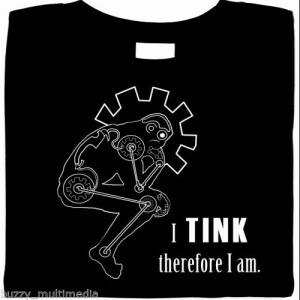 No matter what spectrum of flesh-to-metal proportion variation you fall into, if you are a “thinker” (or a “tinker”), YOU EXIST. 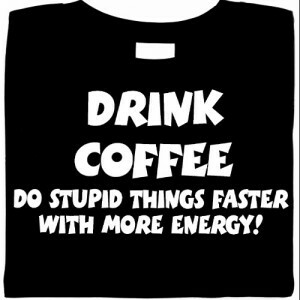 Check out our Funny Tees!